After a recent family diagnosis of breast cancer, my family has been looking for right tool to help tend to my mother’s complex treatment regimen, a regimen which is likely to last a year. I did some extensive study and research into the attempts made so far to bring technology to cancer patients, and it has been daunting and mind numbing. Given how much emphasis we as a society place on finding the cause and cure for cancer (rightfully so), it was surprising to see how difficult it was to find an encompassing technical solution for patients and families. There are a fair amount of applications (designed to run on phones, tablets, laptops) out there, but they seem to have been designed for a) treatment providers (which makes sense, because they’re likely to purchase/use such apps) or b) pharmaceutical companies (which also makes sense, since they have a vested interest from an investment perspective). This phenomenon means app stores are littered with tools that are haphazardly designed, poorly built, lack intuitive experience, focus on mere pieces of the overall treatment and perhaps most importantly don’t address the patient or family’s perspective or needs. I decided to rectify this (and roped my dad in) by designing a solution that first and foremost thinks from the angle of patient who was just diagnosed. Currently breast cancer affects 1 in 7 women above 50 in America, an important statistic since it means (fortunately) that there is a fair amount of research going on. Recent advances in breast cancer treatment have brought about some predictability in terms of what one needs to do upon hearing the news. However, the multitude of choices only means one needs to be seriously equipped with the right information at the right time and make several decisions at an acute level. Those that are built for care providers and pharma companies which focus more on recording treatment details and patient choices and results/observations - all from the perspective of treatment staff. The data they collect, is used by researchers (doctors AND pharma companies) for improving drugs, treatments, methods, etc. Those that are built by survivors (and often sponsored by cancer treatment centers) to keep track of things during the treatment stage. Unfortunately, these are fragmented - often focusing on one very small part of the treatment and not the overall treatment itself. For example, one can find apps dedicated to recording vital signs or weight or memory functions only. Others offer ability to chat with other patients anonymously while still others make it easy to manage all doctor’s appointments via calendar scheduling. And then there are those which assist in stress relief and meditation. There’s a huge variety of apps focusing on documenting the journey, and then finally a few of the apps I found exclusively focus on matchmaking between patients and surgeons, clinical trial facilities, etc. It seems that first group of solutions are backed by ventures and built/operated by companies that have good business relationships with doctors and pharma companies. The second group of tools are mostly one-off, although several reputed treatment centers are attempting to project their desire to be technologically advanced, and as a result are endorsing or white labeling these apps to promote them. I sincerely believe that if we guide patients and family members from step A (discovery of diagnosis) to step Z (one year cancer free) and use the data collected along the way in research to improve treatment plans/methods/tools, we not only have a chance of making cancer less scary, but save invaluable costs in today’s overworked medical system (I have done fair amount of research on this, reminder: to provide concrete data here). Phase 2 (Diagnosis): information overload, surgery? Where? Which oncologist? Which surgeon? Which plastic surgeon? OR Neoadjuvant therapy? Phase 3a (Neoadjuvant therapy): Chemo? Monoclonal antibody treatment? Phase 6 (post treatment): follow ups, tests, healthy lifestyle, etc. During each of these phases, patients and family members need to manage a schedule of events, research information to make informed decisions, pick qualified care providers (surgeons, oncologists, radiologists, etc. ), record vital signs, interact with the nursing staff and communicate with other members of the ecosystem. A logical view of this ecosystem seems fairly obvious. “N” actors working with consistent information that's both generated and consumed by all the actors. Before I could imagine the experience of each actor in the system, I decided to go to the drawing board. Board 1: Managing an event with tend. Board 2: Recording vitals during chemo with vocal interaction. I’m a big believer in using the right tools for the job - and that means I envision humans will interact with information using the right medium, be it visual or vocal. I have listed some interaction examples below which should provide a good idea of where I’m going with this concept. When a user first opens the application, the splash screen (above, left) will appear. The bubbles on the screen will be animated and moving, much like a lava lamp. After some serious thought about whether the app should exist on a dark or light background, we went with white. The rational had to do with hope and lightness, not to trivialize the disease, but rather to make it more palatable. 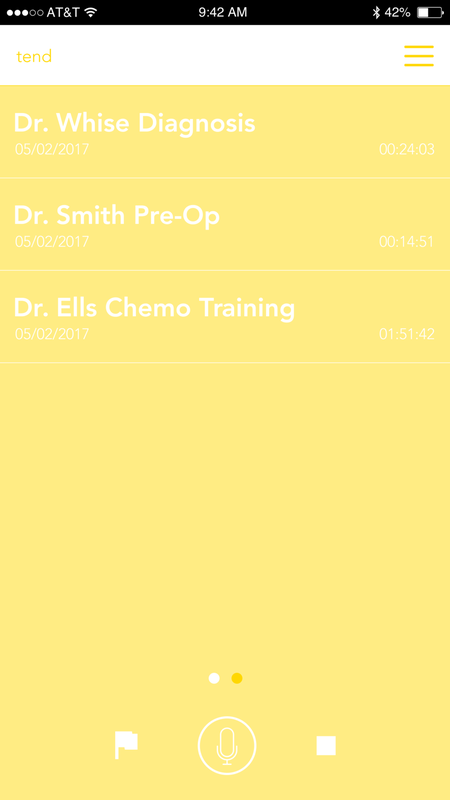 Most of the screens in the app take inspiration from two of my favorite apps to use, Two Dots (a game) and Period Tracker (a menstruation cycle tracker). Both of those applications use the concept of journeys or calendars that the user exists and progresses in. Both also have animated backgrounds-- Two Dots has different backgrounds for different level packs, Period Tracker has an animated tree going through the seasons to symbolize the different parts of your cycle. No obvious animation stood out with breast cancer--but the colors were obvious--so we went with something simple: moving circles in breast cancer pink. After some thought about that though, we realized pink was too obvious and too kitschy. One color I'm a huge fan of is golden yellow, which is thought to symbolize power, something these women have and need a lot of! So I went back to the drawing board with that color. The application's home screen (once the user is logged in) has two major elements (above, left). The patient can see when her next event is, which can range from chemotherapy to radiation to a checkup, and she can also create new events. We've found that the ability to create new events on new dates on the fly is one of the most crucial, if not the most, parts of the battle. It can be overwhelming to a patient and her supporting cast to remember all of the information thrown at her in such a short time. But it is even more overwhelming a prospect to potentially forget a major event-- which is why this function is priority. Above right is the menu, which is accessible from any part of the app. Each of the functionalities is important in its own right, but perhaps second most important is the calendar view. Each day in the user's life is worth noting-- so the most important function of the calendar screen is to promptly add those notes. They can be journal oriented, or they can be one liner's about the user's feelings. Also included are common symptoms, and the user can indicate whether or not she's experiencing those symptoms. At the bottom of the calendar screen is a legend for what each marker on the month indicates. These are customizable, because each woman may have more or less types of events she'd like to remember. Another highly important screen in the app is the user's journey. Each woman experiences completely different things when they learn they have breast cancer and then subsequently begin their fight. But the journey is similar for most in that there are certain steps that each woman must undergo to successfully cure themselves of this disease. When faced with any daunting task, it's nice to know how far along the way you are, and how far you've left to go. This journey enables women to see how many steps they have gone-- and also to see how far along any friends in the community are. So far in my mom's journey, a really important aspect of her care has been remembering the minute details that come from doctors' appointments. Things we could miss if we're not listening carefully during the appointment itself can be caught on your phone now. Some doctors frown upon recordings, others encourage it-- depending on what works for the patient recording can be a very valuable tool. But it can be confusing to use recorder apps (my dad once thought he was recording but hadn't pressed the button), and it can be even more difficult to figure out how to share them with other people, especially the people who really need access. 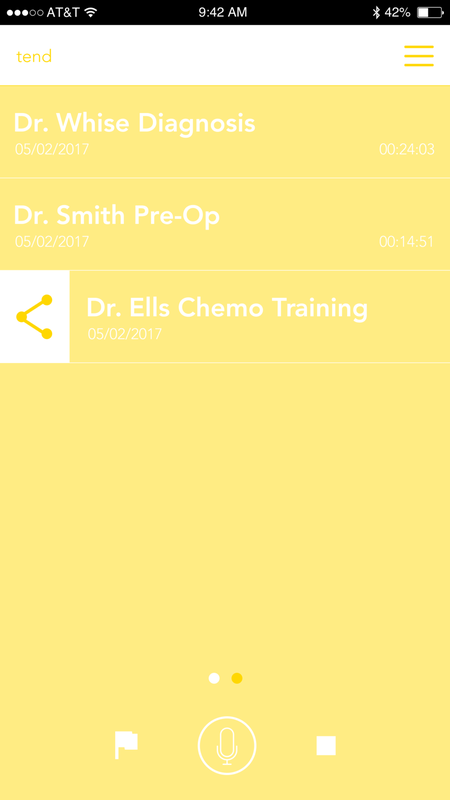 Having the recorder within the application can allow for the patient to share access to the files immediately with her family, and vice versa. Since these are the most important functions of the application, they're the ones I tackled first. Lots of thought went into each decision, and much more will go into the rest. Stay tuned for updates, and the final product!